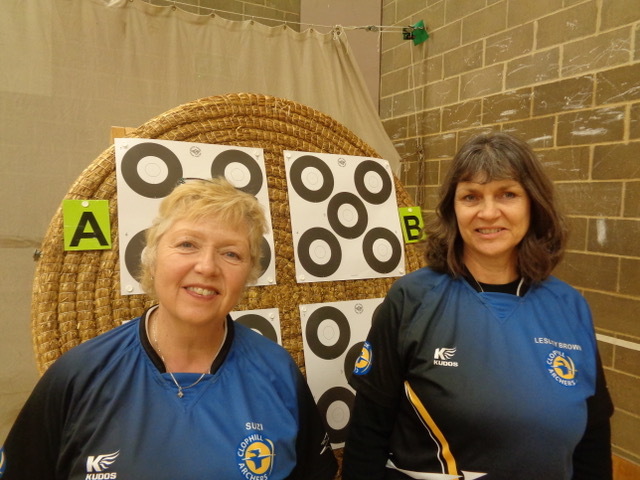 A huge congratulations to Clophill Archers Suzi and Lesley who both scored perfect 300 scores at the Kestrels Worcester on the 3rd Feb.
As you can imagin this perfect score means that they both hold a new joint County record as well as equalling the National record obviously! Please make sure you congratulate them when you see them at the club. As you will have seen from the outdoor season calendar, Clophill Archery Club is running its ‘Spring FITA4’ competition on the weekend of 6th/7th April. The competitions we run are the main source of income for the Club so any help you are able to give is extremely valuable. Thursday 4th April in the evening, to generally tidy up, touch up the field markings, etc. Doesn’t usually take long. On Friday 5th April afternoon (from 1230 or so), to put up marquees, re-mark the field if it rained heavily overnight, put out bosses, tables, tea urn, bins and so on, and generally make ready for Saturday. Usually takes about four hours, depending upon how much help we have. On the days of the competition, from 0630 — or whenever you can be there, for as long or short as you like — initially to put out the timing equipment and flags, and put faces on the bosses and to help with any last-minute field changes. If you are able to stay all day, four of the less able archers would like someone with them to help to collect arrows and mark scores. (Please let me know if this is something you’d be prepared to do.) Otherwise from about 0830 onwards there’s little to do except help look for any lost arrows, top up the tea urn, change faces and keep the judges fed and watered. If you’re not supporting an archer, there’s no need to stay all day (unless you want to). Sunday morning is as Saturday. Then on the Sunday afternoon/evening, from about 4pm, we’ll need help to pack everything away: It usually takes about three hours. This is the important day/time so if you have only a few hours to spare and are wondering when over the weekend to come along, please make it Sunday afternoon. We’re not offering hot food at all this year but if you were able to make/donate cakes or such for us to sell they would be much appreciated by the club (and the archers!). As ever, any time you can spare, however short, will help immensely. Also spot the Clophill Highest scorers esp on first page. Hi all It is the last club shoot (scoring round) of the indoor season on Saturday. As you’ve all had lots of practice shooting indoors all winter we are shooting a WA18. Arrows: 60 in total over ends of 3 arrows. Face: 40cm (the small ones) – you can either shoot single spot, scoring 1 to 10 or triple spot, anything outside the 5 is a miss! You don’t need to shoot the scoring round, if you’re working on form or just want to ping a few that’s fine, all we ask is that you fit in with the timings on the shooting line. Dear all We have our final Frostbite of the season on Sunday. 10.45 for 11.00 am start at the field. The shoot is normally followed by a sociable catch up in the Stone Jug. You will have seen the email about orders for new club kit. If you would like to order anything please let Steve know asap (contact details on the previous email). Congratulations to all the medal winners and thank you to all who took part for helping to make the day such a success. Dear allWe’re are now in March and at the end of this month we are moving outdoors. The Field Party is on 23 March and the first outdoor club session is on the following Tuesday (26 March). As a reminder, our outdoor club sessions are on Tuesdays and Thursdays and we will be entering the normal postal leagues. The postal shoots are on the 1st Saturday of the month starting in May; we shoot a short metric round (50m and 30m). In addition to the postal shoots we will be shooting another scoring round each month on a Saturday afternoon. All the outdoor shoots will qualify for Grand Prix points and you can accumulate scores for your outdoor classification – so points, prizes and badges to be had!! The outdoor shooting schedule is attached, I will also get round to adding the shoots to the club calendar. Please keep an eye on the Club Website (including the calendar and the announcements page) for the dates of shoots. I will also try to get the normal emails round before each outdoor shoot explaining the round we will be shooting. The club field is open to club members 24/7, if you are shooting on an ad hoc basis and want some company a post on the Facebook page might generate some interest. As always, if you have questions please ask a committee member or one of our experienced archers.